It is an input component which is used to select date. 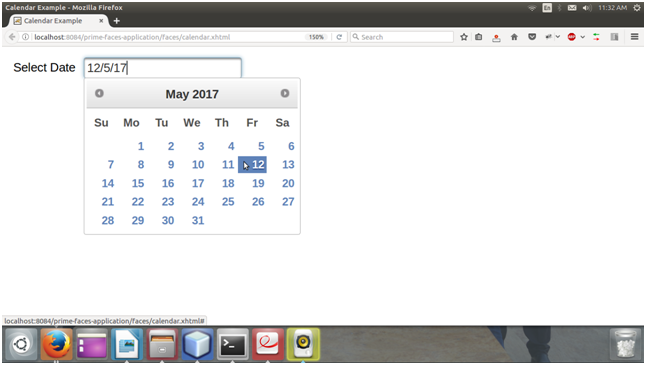 The <p:calendar> component is used to create a calendar in JSF application. It includes various features like: display modes, paging, localization, ajax selection etc. Value of the calendar should be a java.util.Date. The following table contains attributes for the Calendar component. value null java.util.Date It is used to set value of the component. converter null Converter/String It takes an expression or a literal text that defines a converter for the component. mindate false Date or String It is used to set calendar's minimum visible date. maxdate null Date or String It is used to set calendar's maximum visible date. pages 1 Integer It enables multiple page rendering. mode popup String It is used to define how the calendar will be displayed. pattern MM/dd/yyyy String It is used to set DateFormat pattern for localization. timeZone null Time Zone It is used to specify the timezone used for date conversion. showWeek false Boolean It is used to display the week number next to each week. disabledWeekends false Boolean It disables weekend columns. showOtherMonths false Boolean It displays days belonging to other months. selectOtherMonths false Boolean It enables selection of days belonging to other months. yearRange null String It is used to set year range. timeOnly false Boolean It shows only timepicker without date. The following table contains structural style classes. .ui-datepicker It is used for main container. .ui-datepicker-header It is used for header container. .ui-datepicker-prev It is used for previous month navigator. .ui-datepicker-next It is used for next month navigator. .ui-datepicker-title It is used for title. .ui-datepicker-month It is used for month display. .ui-datepicker-table It is used for date table. .ui-datepicker-week-end This class is used for label of weekends. .ui-datepicker-other-month Class for dates belonging to other months. .ui-datepicker td It is used for each cell date. .ui-datepicker-buttonpane This is button panel class. .ui-datepicker-current This class is used for today button. .ui-datepicker-close It is used to display close button. 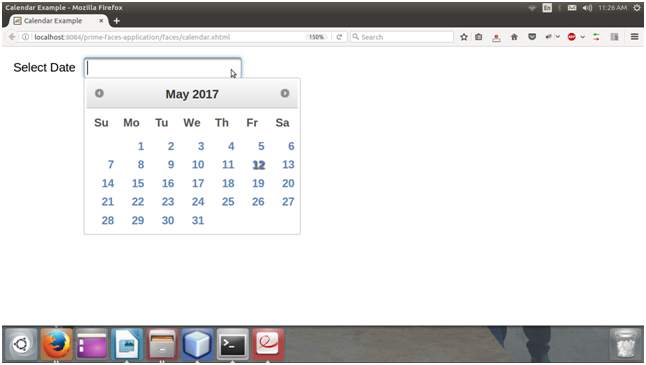 Here, in the following example, we are implementing <p:calendar> component. This example contains the following files. After running JSF file, it produces the following output. It shows message, when we check it as giving below.